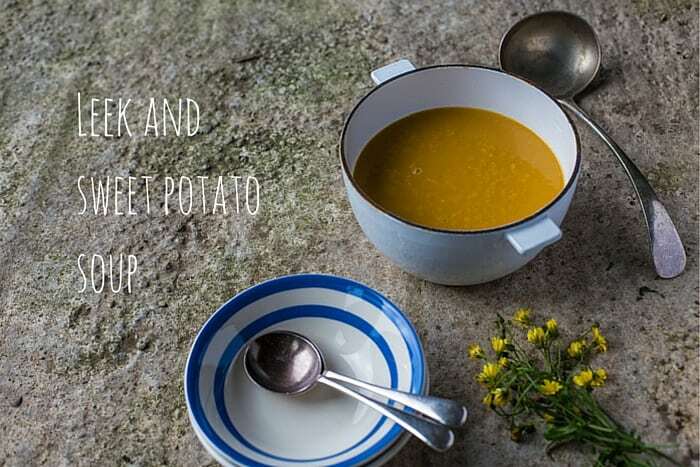 A simple twist on a classic, this Leek and Sweet Potato Soup retains the frugal and comforting kick of the original but with an extra level of earthy sweetness from using sweet potatoes over regular ones. Oh ‘eck! Go pimp your regular leek n tatty soup for this sensational Leek and Sweet Potato Soup and I promise it’ll be love at first slurp! Leek and potato soup has to be one of the most budget friendly meals you can make for your family. Swap those potatoes out for the sweet variety and you’ll still be coming in under £1.60 for this entire pan of soup which amounts to around 6 bowls. That’s less than 30p a bowl! Filling, nutritious and (most importantly in my world) tasty, I reckon the whole family will be happy to sit down to this soup once a week. Freeze any leftovers and you’ll have an easy meal to reheat later in the week or to take to work for lunch. You can also successfully pimp the soup by adding in a teaspoon or two of curry powder or garam masala if you fancy, it balances out the sweetness perfectly. Whizz in a blender until smooth and creamy and add boiling water from the kettle if it's a little too thick for your taste. Add salt and pepper to taste, just be careful with the salt if you've used a stock cube! This looks like my kind of soup, its making me hungry,delicious. I just made a big pan of leek and potato soup and it’s delicious, but now I want to try yours!